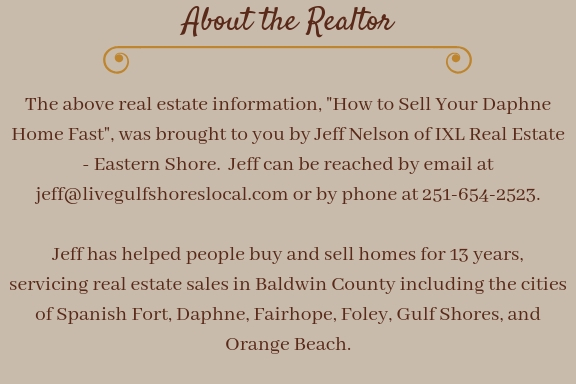 Are you a home owner in Daphne and want to sell? Everyone has their own reasons of course but sooner or later we all sell our homes at some point. Here are some great tips that will put you in a position to sell your home quicker if you put them in action……. There are many things that sellers can do to attract buyers and sell their home fast. I didn’t put it on the list because I figured it was understood but having a Realtor is key to selling versus trying to do it on your own. Your Daphne Realtor (me of course) can give you advice on all of the 13 actions listed above. Let’s get into it! Of all the various actionable tasks that you can do to sell your home quickly, pricing your home perfectly in the very beginning is most important. You could do everything on this list but if your property is over-priced it won’t matter. You run the risk of your home sitting on the market for months or not selling at all. A seasoned Realtor has the tools and the “know how” to properly price your property. Almost always, the reason why the property didn’t sell is because of price. Now, I’m not saying to under-price your property but I am saying we need to find the correct price that will give you the most profit while still attracting a buyer. First of all I get it. Almost all of us accumulate “stuff” over the years (some worse than others) but it is absolutely necessary when you get to the point of selling your home. De-cluttering means to take out everything in the house that will remind the buyer of you. Be a minimalist. Pack up family photos, collectibles, trophies, certificates, knick-knacks, etc. There are 2 major reasons why you should de-clutter. By de-cluttering every room of your house, buyers will be able to see themselves living there and won’t be distracted by the 8 lb Bass that you caught 5 years ago. Also, your entire home will look bigger and you want buyers to think that. Do yourself a favor and do this. You’ll be happy that you did and will have a better chance of selling your home fast. While you’re de-cluttering, this is a great time to walk through your home and get rid of other things that you don’t need. Hey, I’m guilty of this too! We all have items in our house that we haven’t looked at in years. Hold a garage sale (or 2 or 3). Just ask yourself, “Am I using this?”. Will you ever use it? Think about loosing your grip on clothes that don’t fit, old pots that aren’t in use, extra towels, excess plants, and on and on. While you’re at it, take an objective look at the rooms of your home. Can you take out certain pieces of furniture to make the space feel bigger? Once you’ve sold everything you can, consider dropping off what was left at Goodwill or the Salvation Army. You’re going to have to pack up anyway so why not give yourself less to pack and less to bring into your new home? The bigger benefit will be that you’ll sell your home faster. Trust me. To sell your Daphne home fast, you’ll have to appeal to the masses and studies have shown that most buyers are more drawn to homes that have neutral color tones. This gives buyers a feeling of moving into a “clean slate”. I’m mainly referring to wall color. You could always add a splash of color with throw pillows, plants, and tasteful art. So, If you’re dining room happens to be painted Hunter Green, you may want to run to Home Depot. Just a thought. Yeah, it’s not glamorous but it must be done. Take a day to clean a lot more thorough than you normally do. Hit areas that haven’t see any 409 in awhile like the refrigerator, under the refrigerator, the oven, under furniture, the baseboards, etc. I promise you that buyer’s will notice this when touring your home and you only want them to focus on one thing – how great your house is. You may be surprised that a lot of the repairs around the house could be quite inexpensive and won’t take too much time. Walk around your property inside and out, taking an objective look. Check electrical outlets and light fixtures. Look for missing or cracked caulking. Make sure that all sinks and tubs drain properly. These are all quick fixes and you won’t have to address when the buyer gets a home inspection. You’re spending all this time working on the inside but remember, you’re yard and the front of the house is the buyer’s first impression. Doing these things and more can definitely help you sell faster. Since you’ve already spent a day deep cleaning, it should be easy to give everything a quick dust, put dishes away, and throw clothes in the hamper. You want your home to shine whenever a buyer comes through the door. The best time to do this is actually at night because the chances are good that a buyer will want to tour your home during the day and you may be working or out shopping. Yes, we do go nose blind (according to the commercial) and buyers will make a decision to purchase or not solely based on a bad odor. If you have animals you may have to get your carpets professionally cleaned. If you smoke you may have to paint and clean your carpets. You don’t have to go overboard with strong scented candles but a fresh clean smell is always good. Doing this will play a huge role in selling your Daphne home fast. Most buyers prefer light, bright, and airy homes. Keep the curtains pulled back and the blinds open if you know you have a showing. Furthermore, still do this if you have a showing after the sun goes down. The house will look great and inviting from the road with the blinds open and the lights on. Staging is basically removing and arranging furniture and decor. This makes the space look bigger and easy to navigate. Clean site lines is what you’re shooting for. If you spend time preparing your home to sell, your listing will spend less time on the market. This is a tough one if you have to work every day but the best case scenario is to not have your pets home during a showing. There have been times in the past when I couldn’t show a home to my buyer because there were dogs on the other side of the door trying to get at my throat. Well, the seller may have lost a buyer that day. Just do what you can. Not everyone does this but it’s a nice touch. You want buyers to feel welcome and at ease. You probably already know that many of our cable and satellite companies have dedicated music channels with just about every genre. Metallica is probably not a good choice by the way. There is a science and an art to selling homes which you saw a little of both in this article. When I walk into a listing appointment, I have one thing on my mind, “What needs to be done to sell this home?”. My job is not to just put a sign in the yard and hope it sells. That doesn’t benefit anyone. Through 13 years of experience and working with hundreds of clients, my job is to educate and advise you on what it takes to put a Sold Sign in your front yard. Thanks for taking the time to read, “How to Sell Your Daphne Home Fast”. I would love the opportunity to work with you if you are selling. Please contact me and let’s talk about your home.